The relay bypass code works only when the switch is released. I also wanted to add an option to make it temporarily activable trough a switch. Finally, I wanted to add the "anti pop" system that I used before to have a totally silent bypass. The microcontroller is the "conductor" of the circuit. We still use our old 12F675, the NA5WK relay and the TLG222A photoFET. The second switch (SW2) is used to choose between the normal and "temporary" mode. When the switch number 1 is activated, the microcontroller activates the LED, the photoFET to remove the "pop" noise and the relay to activate the effect. Lets go to the nice part: coding! As usual, I recommend you to use the MPLabX software (with the XC8 compiler) to write and modify the code in C, then use the PicKit2 to burn the code (in .hex format) in the PIC12F675. For more infos, please read my original post about the Relay Bypass if you forgot all of this. Classic config for the PIC here. We use the MPLabX software to code in .C, which is way easier to understand and write than assembly code! The code is separated in several parts. Let's see each one of them in detail. Do not forget that you can download the full code on GitHub. Ok, so now we are in the real part of the code :) (main() function). Lets start by initializing all the GPIOs. It looks a lot like the old code we already wrote before. We added one input to have the second switch that allows us to choose between temporary and normal mode. Finally, we reset all the GPIOs to 0 when the pedal is powered. The temporary variable is used to define whether we are in temporary or normal mode. Depending on the state of an external switch, the microcontroller can sense the state of the swtich (it is linked to ground - 0V - or to 5V). It can then change the value of the temporary variable. When you press the switch, there is first a debouncing to check that it is indeed a clic on the switch, using a simple __delay_ms(15). Finally, if the user have indeed pressed the switch, we increment the press_switch variable. The next bits of the code define a maximum of 10 for press_switch. Indeed, if you do not add this part, the value of press_switch can increase way too much and cannot even be stored in the PIC memory! When press_switch is equal to 1, changestate is changed to 1. The microcontroller knows that he has to change the state of the pedal now! Incrementing press_switch to 10 prevents the pedal to change state all the time if you press the switch for a long time... Similarly, press_switch is changed to 2 immediatly after setting changestate to 1 to avoid this. Finally, when the switch is released (GP1 == 1), press_switch is reset to 0. This part works really similarily to the part shown above, except that the state of the pedal is reset to 0 (off) when you release the switch: temporary activation mode! This step changes the state of the pedal (on to off or on to off). It is during this step that the photoFE is activated. The code is totally similar to what I have presented in my post about noiseless relay bypass. It causes a very slight delay for the activation of the pedal (40ms). However, practically speaking, you really cannot tell! There it is! 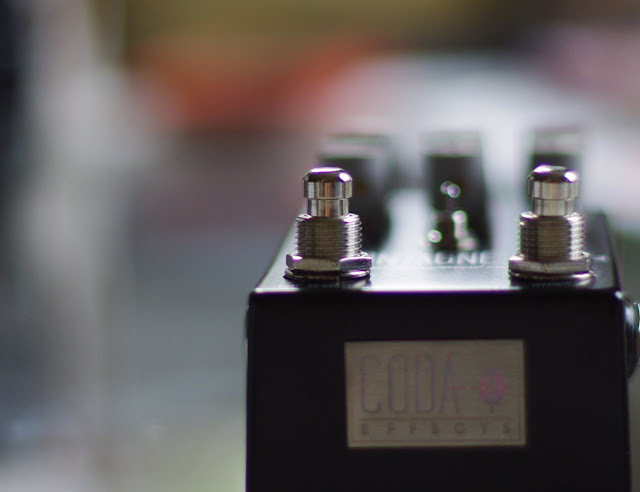 If you liked this post, like the Coda Effects Facebook page or the Coda Effects Instagram for more follow up about the blog. If you have any question or remark, post a comment! Your relay bypass works like a charm w no noise at all. This is great! Thank you, very nice initiative! I'm sorry, I did not notice that attachments on both fsb and madbean forum are only visible for registered users. Thanks for sharing your hard work with us, you deserve more credit. Very nice! I really like the fact that you made it etchable. Could be nice to do a vero version as well. Can I place it in the blog post? I will of course credit you for the design. Of course you can, it would be super cool. But I still think that my layout needs some tweaks and optimization. Can you give me some time to make sure it is compact and usable enough? Did something similar but using assembly instead of C.
Got everything to fit on a 10F200. Used internal pull-up resistors and also used the SLEEP capability to save power. One suggestion, instead of using two pins to activate your relay, put one side of the relay directly to the GND and use a transistor driver on GP5 to activate your relay. That will free GP4. Then you can use GP4 and GPO to turn on a 2 colors 2 pin LED. If GP4 is high and GP0 in low then the LED is one color, if GP4 is low and GP0 high then the LED is another color. That way you could flip the color af the LED to show is you are in Latching mode or in Momentary mode. Don't know if this is clear? I'm french so if you want to talk about this in french. I'm alparent on the Madbean and DIYStompbox forum. Is there somewhere you would recommend to find the relay and pic in Europe? I'm looking for a single shop where I can find both, but that's not that easy it seems. any chance that a different model of the photocell works? the ones ive found of those you stated are expensive where ive found them. thanks a lot! have you tried the above code with 100% sucess btw? It has 16ohm on resistance and 1pf capacitance which is very very low. Great indeed! I will definitely check that out! Just finished a vero layout for this and it's VERIFIED. This works great! Trying to work out a way to remember the state of the pedal before the power is removed so it powers up in the same state. and thank you for sharing this project! Is it possible that some popping that I experience is because I am using TLP222G instead of TLP222A...? Can the code be easily changed to omit the anti-pop and temporary mode features? Of course: To remove the temporary mode feature, just set the temporary variable to 0 and remove the condition loop at the begining (if(GP3==...etc). Hey Benoit, Great articles for us analog folks wanting to dip our toes into digital. I was wanting to implement your code into a pedal that uses both "latching" and momentary bypass switches. The idea is that I would like to use the momentary switch to temporarily (as long as the momentary switch is depressed" "punch in" when the latching switch isn't engaged or "punch out" when the latching switch IS engaged. I'm using the term latching to mean a standard relay bypass style. Hello, Benoit, thanks a lot for your great articles. Already built your relay bypass and it works great (though I haven't put it in a pedal yet). But I have one concern: isn't the ldr resistor (the one which is 1k on the schematic) should be between the 7-th leg of microcontroller and led? That's exactly what I've done, also a hold to enter temporary mode. Instill get a noise from releasing the switch though. No amount of decoupling or ferrite beads can stop it. First off, thanks so much for this! I've got things initially working but am noticing that on initially engaging the pedal, it stays on for about 5-6 seconds and then shuts off, after which point it only works in a momentary fashion. If I touch the contacts on the back of the bypass board, this process resets. This seems like some sort of grounding issue, but do you have any other circuit specific suggestions? I've scoured the board I made for bridged spots and haven't found anything problematic yet. That's weird! Did you power it up with enough current? Thanks for getting back to me - I removed all the temporary conditionals and that seemed to fix the problem. I'm trying this with a pedal that has been giving me a lot of trouble with switch noise (Hudson Broadcast 24v clone) - still getting some audible pop with this, but it seems to be better. I'm going to try extending the delays inside the changeState to see if the noise is from the relay or just because it's a high gain pedal. Thanks again for such an awesome bypass solution! Hey Benoit, I made a single-side pcb layout for your wonderful switching system, wouldn't you mind if I share a link on it here? Thanks again for your huge efforts! Sadly, can't edit my comments. Thank you for this great piece of work. I love it! Did you ever get around on the cut-off problem mentioned by Brent? I got the same problem and can't find a solution.